Using featured images in post archives is a common feature of themes, but sometimes you might want to use featured images a bit differently. Occasionally I've worked on sites where the images to be displayed relate to the category a post is in and not to the post itself. Instead of adding the same featured image to every post in each category, it would be much simpler if I could just assign the category to each of my images, and then display the featured image for the category with the post. Applying categories to attachments: we'll need to do this so that each category has its own attachments. 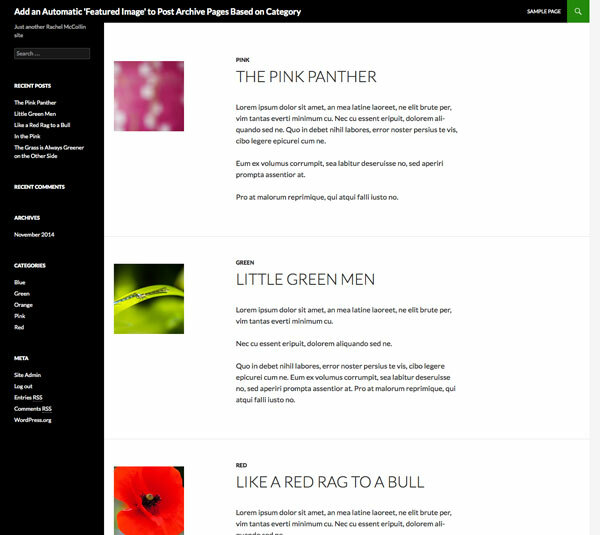 Creating a 'featured image' for a category: in this tutorial I demonstrated how to create 'featured images' for categories and then display them on the category archive. This tutorial is slightly different as I'll be displaying the category images on the main blog page. Note: For each post only one category will be identified, and for each category only one image will be output (the most recent). I'll also look at how you can adapt this technique for other archive pages, such as custom post type archives. To follow this tutorial, you'll need to create or edit a theme. I'm going to create a child theme of the Twenty Fourteen theme. This sets the theme up as a child theme of Twenty Fourteen. If you need to know more about creating child themes, take a look at the relevant Codex page. As you work through this tutorial you'll also create a functions.php file for your theme (or edit the existing one if you already have one in your theme), and create an index.php file too. 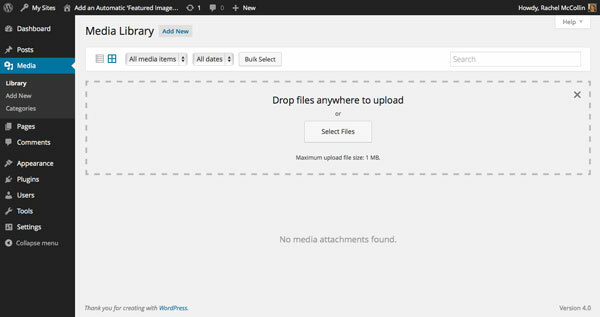 By default WordPress doesn't let you assign categories to attachments, but this is easily changed. Note: For more on this, see this tutorial. Now that we have the posts set up and the category images in place, we need to edit the index.php file to display the category featured images. * The primary template file. * Based on the `index.php` file from TwentyFourteen, with an edited version of the `content.php` include file from that theme also included here. // Display previous / next post navigation. // If there is no content, include the "No posts found" template. 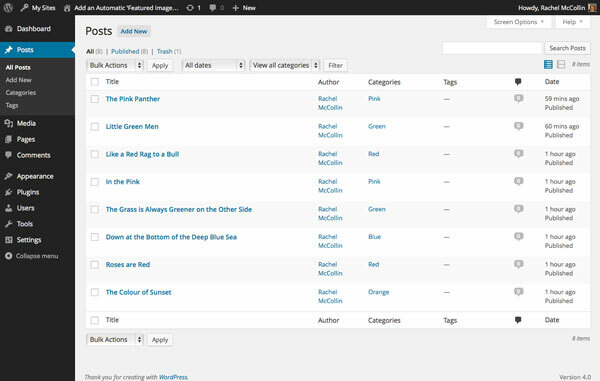 To display the relevant category image, you'll need to identify what category the current post is in. You'll need to do this inside the loop. This creates a variable called $category, whose value is the ID of the first category the post is in, using the get_the_category() function. These arguments mean that your query will output just one attachment in the category you've already identified. Note that you must use the 'post_status' argument because attachments default to 'post_status' => 'inherit', not 'public' like other post types. This puts the image inside a div with the category-featured-image class, which you can use for styling. It then uses the wp_get_attachment_image() function to display the image. Right now there's too much empty space, so let's add some styling. With a custom post type, you would create a archive-$posttype.php template file for that post type with a similar loop to the one above. If you're using a custom taxonomy instead of categories, you would add the 'attachment' posts type to the post types the taxonomy is registered to when you first register it. You'd then replace the get_the_category() function with get_the_terms() and the category arguments for your query with taxonomy arguments. You could combine two taxonomies by displaying the images from one taxonomy with posts on the archive template for another taxonomy, maybe with the image linking to the archive page for its taxonomy term. 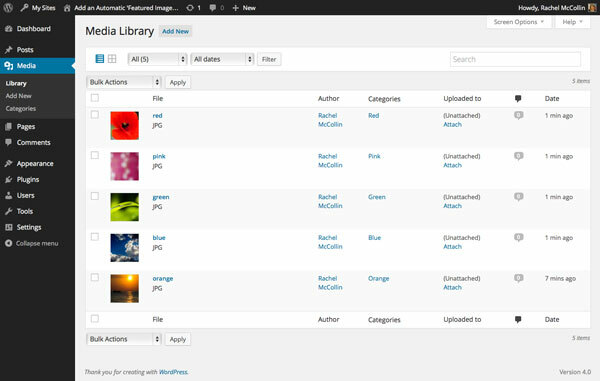 You could use a similar technique to the above in your archive.php file if your theme has one, so that posts in archives also have a category featured image displayed. If you wanted to combine one or more of the above, you could create an include file with your loop (including the category featured image) and call that in the relevant template files. 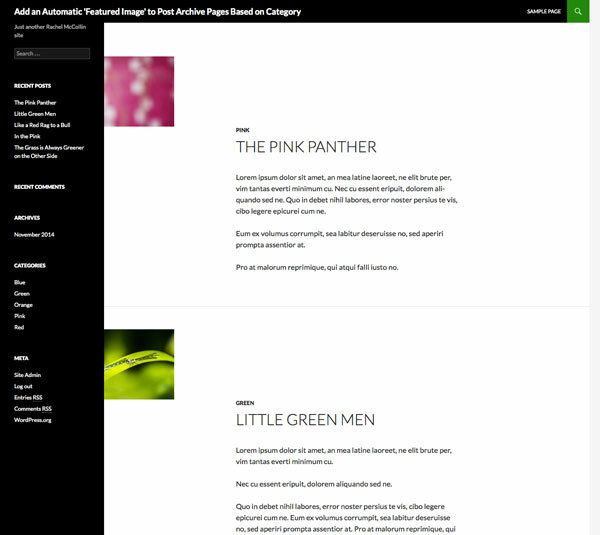 As I outlined at the beginning of this tutorial, there can be scenarios where instead of showing a featured image for each post, you want to display an image relating to the category the post is in. In this tutorial you've learned how to do this, by adding categories to attachments, identifying the first category for each post in your loop, and then creating a query to output the image for that category.